Most older adults want to live out their retirement years as independently as possible in their own homes. Families want the very best for their loved ones. DignityFirst Health at Home creates customized solutions to accomplish both through its integrated model of professional geriatric care management and comprehensive in-home care services. DignityFirst understands. Our teams of experienced professionals have extensive training in the challenges of aging and disability. With a holistic approach, our experts are successful in anticipating needs, communicating effectively, managing challenges, and enhancing quality of life and safety for our clients. DignityFirst Health at Home is a local Colorado company founded in 2011 with a mission of making the elder care experience a better one. We are different because of our integrated model of professional geriatric care management coupled with comprehensive in-home care services. A Care Manager is a credentialed expert in managing care issues with a specialty in social work, nursing, or mental health. We have an established record of integrity, trustworthiness, resourcefulness, and genuine commitment to our clients. We provide non-medical services in our client’s homes and communities. 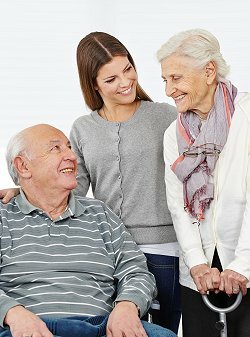 Services can range from companionship, protective oversight, socialization, transportation, meal preparation, housekeeping, and laundry all the way to full personal care to include bathing, showering, toileting, dressing, grooming, ambulation, transfers, medication reminders and complete bed rest care. Under the auspices of our professional care managers, we offer various specialty care programs. DignityFirst will perform a comprehensive assessment and make recommendations based on our experience and expertise. However, it is always up to our clients and their representatives about how much care they need. We then create a customized plan of care to provide that assistance. We serve adults at all levels of health. Whether an individual needs a limited amount of post-hospitalization or post-surgical care, to a significant amount of care for an individual suffering from a chronic, debilitating illness, DignityFirst has the depth of knowledge, education, experience, and devotion to our clients to help in a significant way. We also offer ongoing daily care services to the disabled. In particular we are available to assist aging parents with a disabled adult child, both for the short- and the long-term. Additionally, DignityFirst Health at Home provides a wide variety of holistic and wellness oriented services. If you are caring for a senior from a distance, we can provide local in home care to your elderly parent and then our highly trained Geriatric Care Managers can communicate with you on a regular basis with updates about your loved one. We’ve become affectionately known to client families as “the professional daughters who live in town”. Our goal is to help our clients live life to the fullest level possible, while giving our clients and their families peace of mind knowing we are genuinely there for them anytime 24 hours a day, every day of the year. DignityFirst Health at Home provides care in the following Colorado counties: Adams, Arapahoe, Boulder, Broomfield, Denver, Douglas, Jefferson, Park, and Weld. Aurora, Bennett, Bow Mar, Centennial, Cherry Hills Village, Columbine Valley, Deer Trail, Englewood, Foxfield, Glendale, Greenwood Village, Littleton, and Sheridan. Applewood, Aspen Park, Arvada, Bow Mar, Columbine, Conifer, Edgewater, East Pleasant View, Evergreen, Fairmount, Genesee, Indian Hills, Golden, Ken Caryl, Kittredge, Lakeside, Lakewood, Littleton, Morrison, Mountain View, Pine, Superior, Westminster, West Pleasant View, and Wheat Ridge.